I say this all the time, and I mean it! I actually have two tiaras now; I got one at Disneyland last year. It’s a Princess Aurora tiara, she’s my favorite Disney princess. My two tiaras sit on the shelf above my desk. The crystal one a good friend got me for my 33rd (or was it 34th) birthday is being worn by R2D2 and my Princess Aurora tiara is proudly worn by my pink Susan G. Komen Darth Vader replica helmet. 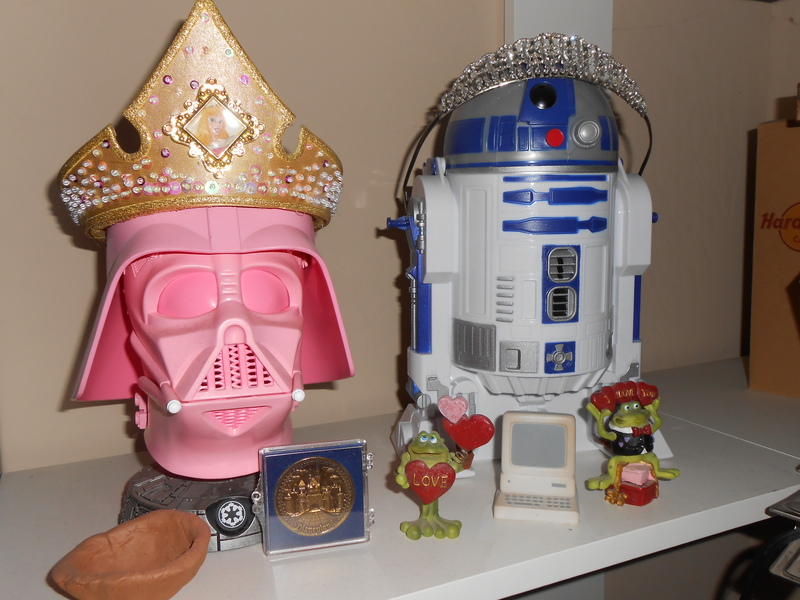 Yes, Darth Vader and R2D2 are wearing tiaras. What can I say, I’m a geek and a goofball, but it works for me! Putting aside the tiara talk for a moment (we will come back to it) I want to talk about being a princess. I had an interesting conversation with some friends yesterday about this and it got me to thinking about how often this saying is used in today’s society and how often it is abused. Yes, I am a princess. I am a child of God, and as His daughter I am a princess. What does that mean though? Does that make me someone more elite than anyone else? Nope, not at all! Being a princess is not something I’m entitled to. When I was born people around the world weren’t glued to their tv screens waiting to hear if I was a girl or a boy. My mom wasn’t plastered all over magazines and talk about what kind of mom she would be, whether or not she would use a nanny all the time (I’m sure she would have loved to have one just once a month to let her have a good night’s sleep) or whether she would breast feed, or use cloth diapers or disposable, or any of the hundreds of other ridiculous things the royal watchers do when a little prince or princess is to be born to the House of Windsor. Being a princess doesn’t entitle me to more than anyone else either. It doesn’t make me a member of some super secret princess club; there isn’t a secret princess handshake where you have to wiggle your fingers, sprinkle glitter in a circle, curtsey, drink tea with your pinky out, and say “Someday my prince will come!” then I’m in! Haha! For goodness sake, I don’t even like tea! Icky! What I mean when I say I am a daughter of the King of Kings so that makes me a princess is that I am dearly loved and wanted. If you’ve read my blog before you know some of my story. My first marriage was abusive, I was molested, my family is dysfunctional at best (crazy nuts at worst) and my self esteem is just as up and down as the stock market at times. When I became a believer I struggled with how on earth could an amazing God love someone as messed up as me, but my friend Christina told me that I am His daughter, I am dearly beloved. She explained to me that when Christ came into my life I became a child of God, a child of the King and that makes me a princess. “Yet to all who did receive him, to those who believed in his name, he gave the right to become children of God -” John 1:12 NIV. Not a princess of this world but a princess dearly beloved and cherished and I’ve held onto that. I have down days when it seems like things just aren’t going where they should, when I feel like I’ve messed up royally (haha) and that is one of the things I cling to. I remember that God loves me because I am His child, His daughter, not because I’m this super perfect princess with a fluffy gorgeous dress who manages to do it all right and has it all together, but because I am just here and I am His. He created me to be the woman I am, goofy sense of humor and all. I think that Psalm 139:14 (which is my life verse if you’d like to call it such) goes right along with the “princess” talk… “I praise you because I am fearfully and wonderfully made; your works are wonderful, I know that full well.” (NIV). It doesn’t speak directly to the princess thing, but it speaks to my own self esteem issues, it reminds me that God created me and no matter how bad I feel about me, what He does is not crud. I am not crud no matter how cruddy I feel. Now, a word of caution about being a princess… we are all princesses, daughters of the king. Notice how I’m not capitalizing “princess” as a title? Not like you would “Princess Kate” or “Princess Diana”? It’s not an entitlement; it’s not something that makes you better than anyone else. It’s just part of who you are as a daughter of God. After our conversation yesterday I had a conversation with my 14 year old daughter, just to make sure she “got it”. She did, when I broached the idea of being a princess not making us any better than anyone else her response was almost a, “duh mom!” moment! I love my kids! Being a princess is not something that we should take for granted, or can “use” to our advantage, or heaven forbid as a witnessing tool. Can you imagine? “Yes, and you too can have this beautiful sparkly tiara if you’ll just accept Jesus into your heart!” It’s not a prize to be won, it’s not something to throw around like you’re so much better than someone else because hey, you’re a princess. It’s just because you’re a child of the One True King and He loves you! It’s something to share with all the other women and girls that you meet because they too are princesses; He loves them just as much as He does you! We can’t forget that part… the fact that His love for all His daughters is just as infinite as His love for one of us. I’m not the only princess out there. In a worldly kingdom there are only so many princesses, in God’s kingdom there are sooooo many princesses! See the difference? Back to the tiaras real quick… I don’t really wear them when I vacuum, well I think I did once but it was only because someone wanted to actually see me doing it. In all honesty I don’t vacuum unless I absolutely have to, that means I vacuum only when someone is coming over and no one else is available to do it! No, that’s not because I’m a princess I’m just lazy! Now you know my secret! Thanks! 🙂 God’s mercy, grace and love constantly amaze me!